The Great House traditions derive from ancient Dunmer clans and tribes, but now function as political parties. In modern times, Morrowind is ruled by the Grand Council of five Great Houses: House Redoran, House Telvanni, House Hlaalu, House Indoril, and House Dres. 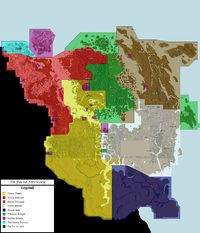 Each House governs an eponymous district on mainland Morrowind; Redoran in the northwest, Hlaalu in the western-center, Telvanni in the east, Indoril in the central heartlands and Dres in the southeast. Three of the Houses also have interests in the island of Vvardenfell, and identify themselves by their traditional colors: red for Redoran, yellow for Hlaalu, and brown for Telvanni. The houses Indoril and Dres identify themselves respectively by their traditional colors white and blue.